It’s not often you meet a dog in a museum but author Mark Vette and his canine companions will be front and centre at the Taupō Museum this Friday, March 23. Mark will present his new book, Dog Zen, alongside the museum’s current Chinese New Year exhibition called Dog Show. The exhibition of dog-related artwork and sculpture runs until April 2. 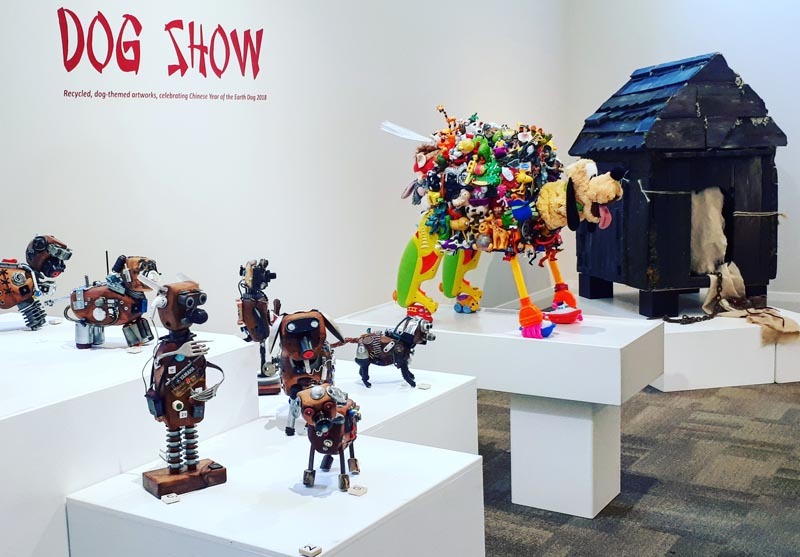 Exhibitions Officer Kerence Stephen says all the works have been created with recycled or repurposed materials to best reflect the “earth” aspect of the current Chinese year. Sculptures have been made from a huge range of materials, including driftwood, bike parts and paper maché. The works have been created by artists from all walks of life, including a plumber, master carver, a seven-year-old boy, and a prisoner from Tongariro Prison. Inclusion is a focus of the exhibition. “We wanted to show that you don’t have to be a professional to make something that people enjoy,” Kerence says. It has drawn a new crowd to the museum, as dog lovers are able to bring their pets with them into the gallery. Visitor numbers have been high and guests are commenting how much fun Dog Show is. “Museums are usually quiet places but you can hear laughter coming from the exhibition,” Kerence says. Vision impaired visitors have enjoyed being able to bring their guide dogs to a dog-friendly exhibition. One artist, who also works as a carer brought in his blind employer to experience his work through touch. The Taupō Museum is open from 10am to 4.30pm daily and closed on Easter Friday. Original generation time 1.3993 seconds. Cache Loaded in: 0.0607 seconds.